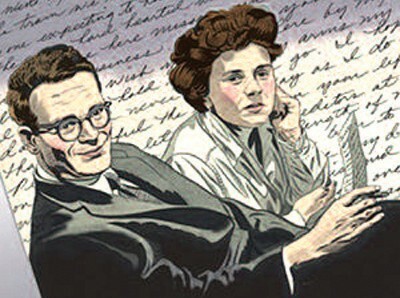 “Dear Elizabeth” is based on the letters exchanged over a 30-year period between two Pulitzer Prize winning poets, Elizabeth Bishop and Robert Lowell. Their friendship was complicated — built on respect and genuine affection. Ms. Bishop was an alcoholic and Mr. Lowell would probably be diagnosed as bipolar today. Despite their struggles, they each regarded their friendship as a key element to sustaining them as they navigated successful careers and very troubled lives. Ms. Bishop’s father died before her first birthday and her mother was committed permanently to a mental hospital soon after. “When you write my epitaph, you must say that I was the loneliest person who ever lived,” Ms. Bishop once told Mr. Lowell. She owned a home in Key West, published 101 poems in her lifetime,and was appointed the U.S. Poet Laureate in 1949. Ms. Bishop bought a home in Key West in 1938 with her then-lover Louise Crane. She sold the home in 1941 after she and her subsequent lover, Marjorie Stevens, parted ways. Soon after she began to travel, but got no further than Brazil where she met the wealthy and vivacious Lota de Macedo Soares. The two women remained together for 16 years. It was during this time that Ms. Bishop composed some of her greatest poems. Ms. De Macedo Soares committed suicide in 1967, and Ms. Bishop eventually returned to the United States, where she taught, wrote and continued her struggle against alcoholism and depression. Mr. Lowell won the Pulitzer Prize in 1940 and was appointed Poet Laureate in 1947. He wrote volumes of award winning poetry throughout his life, but Mr. Lowell also struggled with episodes of mania and depression throughout his life. Between 1947 and 1964, a period that included his winning the Pulitzer Prize, a marriage and the birth of a daughter, and the publication of two of the most important books of American poetry, Mr. Lowell was hospitalized 12 times for mania. From 1947 until Lowell’s death in 1977, Mr. Lowell and Ms. Bishop exchanged correspondences. They periodically visited each other and even dedicated poems to each other, but it is their letters, all 459 of them, that speak to their dedication to each other. And it is these letters on which Fringe Theater’s production of “Dear Elizabeth” is based. The show is directed by Fringe’s artistic director Rebecca Tomlinson and features Andrew D. Cannady and Paula Cabot along with cellist Denise Nathanson.